homes and 6,000 residents and is continuing to expand. It is well supported with sports facilities including a sports park, golf course, cricket oval, medical and educational facilities, a wonderful village green and Liberty Square, which has a variety of shops and supermarkets. There is a network of cycle paths, walks and bridleways that connect to both the residential and commercial areas of the village and of course our Community Centre, which brings both residents and hirers together. Through our website, the Parish Council will aim to guide you to the latest news, updates, events and Parish Council meetings, which will ensure that you know what is happening in and around the Parish of Kings Hill. Used in the First World War as an emergency landing area, the airfield became a private landing ground in the 30’s and was a well known and popular flying venue for air shows and displays being held by aviators such as Amy Johnson and Alan Cobham. The military took over the airfield at the start of the Second World War and RAF station West Malling was formed in June 1940, designated as one of two RAF Fighter Command stations assigned to C Sector, and as an advanced aerodrome for RAF Kenley and RAF Biggin Hill. RAF West Malling was not fully operational during the Battle of Britain suffering from several damaging bombing raids, local rumour saying that the wooded areas of Kings Hill are still haunted by ghost of air personnel killed, but did play an active part in the later stages of the air campaign, becoming a premier night-fighter base. No. 29 Squadron, flying Bristol Beaufighters, arrived for its first tour of duty on 27 April 1941, one of the Squadron's pilots, Guy Gibson VC, later officer commanding 617 Squadron the famous Dambusters, said of the station "Of all the airfields in Great Britain ... we have the most pleasant", Gibson Drive being named after him. On 16 April 1943 a single-engine aircraft was heard approaching the airfield. The plane circled twice, then landed. Station staff, sent a crash crew to meet the pilot, but on arriving, they discovered a German Focke-Wulf FW-109. The pilot, Feldwebel Otto Bechtold, immediately gave himself up to the ground crew. On the same day a second aircraft landed but realising his mistake, the pilot attempted to take off, under fire, and was injured as the plane crashed on the airfield, and a third FW-190 tried to land but undershot the runway, crashing into an orchard. From 20 June to 21 July 1944, No. 322 Squadron, stationed at West Malling, tasked with intercepting V1 “doodlebug” flying bombs and stopped a number of bombs reaching London. The station also saw further service after the war, first with some of the RAFs first jet squadrons, and later as a US naval Air Station. The former Officers Mess, now the Gibson Building, and used as Tonbridge and Malling Borough Council offices, was built in 1939, and is now Grade II listed, with the Officers' Mess itself being used as the Council Chamber. The control tower - also listed - is largely complete in the form it was in 1942 and faces towards the location of the main runway, the ground floor having been restored as a gallery and coffee shop. Situated near the site of the old guard house, a memorial to the personnel stationed at RAF West Malling was unveiled on 9 June 2002. Otto Bechtold, the FW-190 pilot, was a guest of honour at the ceremony. During 1973 the airfield’s unused accommodation blocks were converted for use as temporary homes for around 30,000 British passports holders who emigrated to Britain, following a decree, by Idi Amin of Uganda in August 1972 ordering the expulsion of Asians who were not Ugandan citizens. Several films and TV programmes, including The Beatles 1967 film Magical Mystery Tour, the 1972 television series Pathfinders and the 1982 television drama series “We’ll meet again”, used the airfield as a location during production, with aerial sequences for an episode of the TV series Dempsey and Makepeace were filmed here in 1984, involving some spirited flying by a Topflite de Havilland Heron G-ANUO. After closure as an operational air station in 1969, West Malling acquired a more civilian guise, hosting several major Great Warbirds Air Displays during the 70s and 80s. 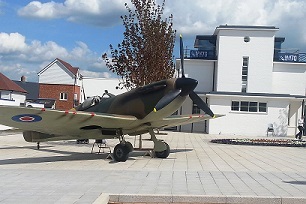 RAF West Malling is now a new village community, including over 2,000 homes, two schools, civic amenities, community centre, local retail and business units, an 18-hole golf course and an all weather sports centre, while still retaining several features of its military aviation heritage.